The Establishing Shot: The Establishing Shot: The Pedro Almodóvar Archives Launched this week. This week Taschen launched another absolutely outstanding volume to their definitive film Archives collection. This time genius Spanish Director and unashamed Auteur Mr. Pedro Almodóvar joined the ranks of film heavyweights; Ingmar Bergman and Stanley Kubrick when Taschen released The Pedro Almodóvar Archives. - Over 600 images, including many previously unpublished. - Includes images from his new film, The Skin I Live In (2011), which will be released worldwide at the same time as the book. - Book includes a film strip from Volver (2006), taken from Almodóvar’s archive. Sadly The Pedro Almodóvar Archives did not receive a London launch but was celebrated at packed book launches at both Taschen’s LA and New York shops. Both launches were attended by literati as well as stars coming along to celebrate with Almodóvar. The Taschen Beverly Hills launch was moderated by long time Almodóvar collaborator and friend Antonio Banderas. 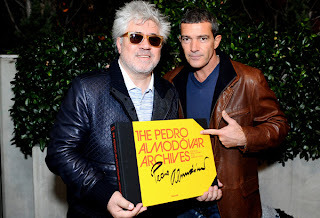 A couple of days later The Pedro Almodóvar Archives was launched in New York to another packed house with both fans and stars queuing to get a signed copy of the book and celebrate the launch of the insightful tome as well as the career of one of cinema’s boldest and most colourful masters. 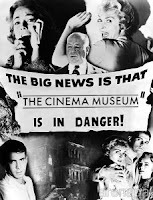 It really does need a proper read but I have had a chance to look through The Pedro Almodóvar Archives and like the; Ingmar Bergman Archives and the absolutely staggering Stanley Kubrick Archives it offers an in-depth analysis of Pedro Almodóvar’s films placing them in context of the wider landscape of cinema and his personal development. Almodóvar also reveals his insightful thoughts on making each film and well as his vision. All accompanied by stunning visuals and never before seen behind the scenes photography as expected from a Taschen publication. The Pedro Almodóvar Archives is available from Taschen online or any real world Taschen shop.